Artist's Residency, 2011. Holualoa Art and Cultural Centre. Big Island, Hawaii. Pu'uhonua o Honaunau, City of Refuge. The works allude to living coral as colourful, protective 'sea-blankets', and endangered coral, as white skeletal, fragmented forms. 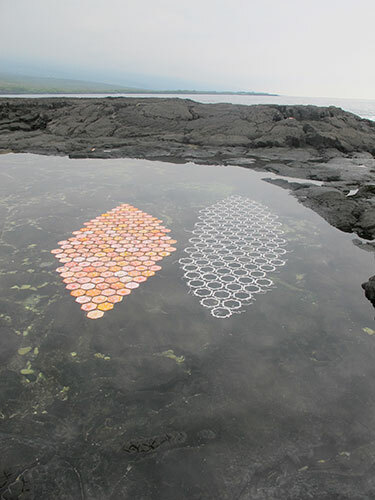 During the residency the two floating artworks were created in collaboration with the Holualoa community, local artists and students. The residency became an open workshop where artists created paper stencils, to overlay the coloured forms with intricately detailed coral imagery. Students from West Hawaii Explorations Academy (WHEA) wrote words of hope about the ocean around the cells of the skeletal work. Materials: Plywood, hand cut stencils, water based pigment, natural fibre. Images: Eric Edwards, Miho Morinoue.